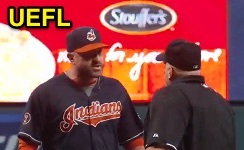 HP Umpire Eric Cooper ejected Indians Pitching Coach Mickey Callaway for arguing ball calls in the top of the 5th inning of the Tigers-Indians game. With none out and none on, Indians pitcher Danny Salazar loaded the bases with one out, prompting a mound visit from Callaway and subsequent ejection. Replays indicate that of Cooper's 12 called balls prior to Callaway's ejection, Cooper officiated all 12 properly for 100% accuracy (12/12), the call was correct. At the time of the ejection, the game was tied, 1-1. The Tigers ultimately won the contest, 7-3. This is Eric Cooper (56)'s second ejection of 2015. Eric Cooper now has 8 points in the UEFL Standings (4 Previous + 2 MLB + 2 Correct Call = 8). Crew Chief Gary Cederstrom now has 7 points in Crew Division (6 Previous + 1 Correct Call = 7). This is the 104th ejection of the 2015 MLB Regular Season. This is the Indians' 3rd ejection of 2015, 3rd in the AL Central (KC 9; CWS 5; CLE 3; DET, MIN 2). This is Mickey Callaway's first ejection since August 30, 2014 (Bill Welke; QOC = N [Check Swing]). This is Eric Cooper's first ejection since June 15, 2015 (Maikel Franco; QOC = Y [Balls/Strikes]).